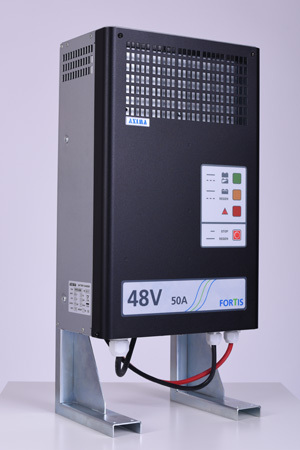 FORTIS chargers are designed for industrial use, mainly for charging of traction deep-cycle batteries (Laed-acid, GEL, LiFePo4,...) for electric vehicles. Chargers are intended for charging of batteries with Unom 12V-96V and current from 25-225A. (Chargers of other power on request). 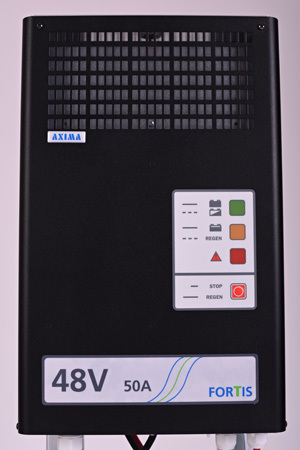 Chargers are modular construction, consist of control unit and power module(s) (input 1ph 230VDC or 3ph 400VDC). Important operating data are displayed on display during the charging. At FORTIS chargers could be set charging curve and battery capacity. Operational stages are signaled by three big LED lights, status of charging is visible from long distance. Output current is adjustable to battery capacity, operating stages are signali-zed by free LED lights. FORTIS chargers comply with european standards of using PFC at electronical devices.